Bio: New York artist Marlene Wiedenbaum is a graduate of Queens College, State University of New York (SUNY), New Paltz, and she studied at the Arts Students League in New York City. In 2010 she was awarded a residency through The Catskill Center for Conservation & Development. 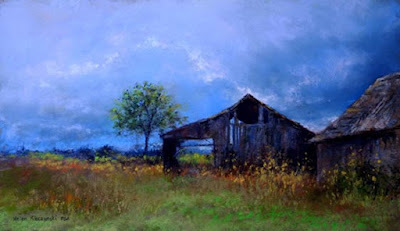 A Signature Member of the Pastel Society of America, she is also an Active Member of the Woodstock Artists Association & Museum, the National Academy of Professional Plein Air Painters (NAPPAP), New York Plein Air Painters (NYPAP) and LongReachArts. Her work is in private collections & is represented in the Tri-State area. Marlene accepts commissions and teaches at Barrett Art Center in Poughkeepsie, NY. Marlene has exhibited extensively since 1999 and her award winning paintings have been exhibited internationally, including the International Pastel Exhibition in Taipei, Taiwan in 2010, 2012 and 2014, As a result, her work is among that of six International Master Pastellists featured in two text books commissioned by the Taiwanese government. She is listed in Art in America. Marlene was among ten semi-finalists for the Basil Alkazzi Award for Excellence in Painting in 2012. Marlene was a featured artist in the November 2010 issue of Art Times and the December 2009 issue of American Artist. One of her paintings was also selected by American Artist Magazine for their 2011 calendar. Subjects: Landscape; Figurative; Still Life. I am a passionate realist, working with a palette of soft pastels, sanded paper, and a kneaded eraser. My early years of working in the abstract helped me refine my handling of the medium and sharpen my understanding of shape and form as it manifests in the natural world. I feel obligated as an artist to reflect the world I live in, to look keenly at my environment, and to present it to the viewer in an engaging way. Navigation: Main menu remains at left of page. Image View: Thumbnails enlarge in a new window, and may be further magnified. Information is provided on medium and dimension. Images may be saved for offline perusal. 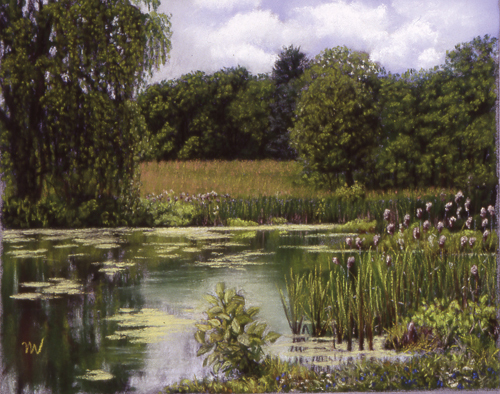 Valkill Pond is 17 x 20 ins. Bio: Helen Kleczynski graduated from the University of Oregon’s school of architecture in 1984. She soon discovered coloured pencils and worked with them exclusively for the next 15 years, then decided to explore mediums that would allow her to work faster, and make alterations with more freedom. In 2004, she took her first pastel lesson from a friend, and after a pastel was accepted into the Pastel 100 in 2010, she invested a large set of pastels that included muted colours, as well as the more vibrant shades. This was a turning point for the artist. Helen teaches at her studio in Vicksburg, Michigan, as well as other locations. She is a member of the Great Lakes Pastel Society, the Northern Indiana Pastel Society, the Plein Air Artists of West Michigan, and a signature member of the Pastel Society of America. Gallery: American Landscapes; Seascapes and boats; Italian Collection; Still lifes; Prints. Image View: Thumbnails enlarge on the same gallery page, and may be saved. Information is provided on medium and dimension. Old Barn is 10 x 17 ins. 562 x 325, 30 KB. Bio: Andrée Bienfait was born in 1956 in Belgium where she spent her youth and there began to paint under the guidance of painters of her native region, the Ardennes. She started art classes in high school Izel (Gaume), then continued her studies in the Ecole Supérieure des Arts in St Luc in Brussels. With the desire to further her profession, Andree went from Belgium to Alsace in order to study with the renowned Claude Lapointe at the Ecole Supérieure des Arts Décoratifs in Strasbourg. In 1981, Andrée Bienfait moved to Strasbourg, in north-eastern France, working as a book illustrator for over 20 years, mainly books for children and young people (there’s a considerable list under Bibliographie). In the new millennium Andrée decided to develop the business of care assistance in order to enrich and complement her profession of illustrator. The older people she met re-awakened her primary artistic passion: fine art painting! Since 2007, she has been painting in a larger format, in oil and pastel. 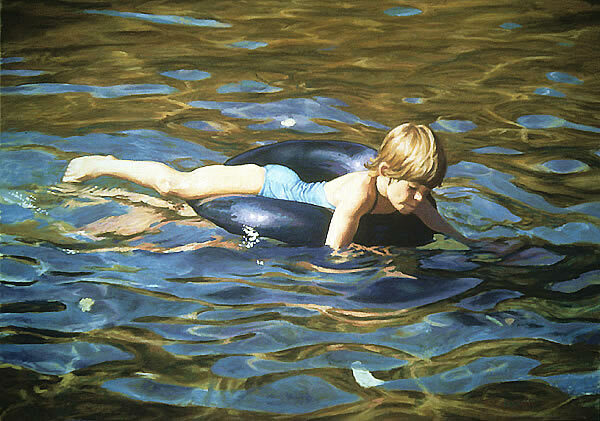 She is primarily a portraitist; children, the elderly, all ages and ethnicities are grist to her mill. Currently resident in Franche-Comté, she exhibits also in the Vosges region. From 2012, she spread her net to surrounding departments and began to win prizes - I came across her work in Saint Aulaye, in the Dordogne, where her work was acquired by the Museum of Pastel. A member of IEDAC (Institut Européen Des Arts Contemporains), she was recipient of their Gold Medal in 2014. Navigation: This website is in French, but the essence – the images – is readily available. Gallery: Tableaux; Portraits; Croquis (sketches); Illustration. Image View: Thumbnails enlarge in a viewer on the same page and can be saved. Information on material and dimension is lacking, although the pastels are readily identifiable. Sensuelle won first prize in the 2013 Salon of the Pastel Society of East Paris (Regards de Pastellistes). Blog : The website is in blog format. Bio: Canadian artist Jessica Masters has been living in Guelph, Ontario for over ten years. She received her bachelor degree in Fine Art at the University of Guelph in 1995. She trained in printmaking, and worked as a printmaker for seven years at the University of Guelph. She teaches the craft, and is currently an instructor for Guelph Art School, as well as teaching privately and giving workshops. Her work has been exhibited widely in both group and solo exhibitions, and is held in many private collections throughout Canada and the U.S.
My work is inspired by elements of the landscape such as skies, water, silhouetted trees and simple architectural forms. I love to use light, colour and simple shapes to define the landscape and the atmosphere within it. For me it is the atmosphere that I respond to emotionally and that is what connects me to the places I have been. A particular light or colour can trigger my memory and momentarily take me from present to past. I feel drawing is an important tool to be able to describe each scene and coupled with loose brush work and muted palettes I hope to recreate the images like memories rather than pure representation. Navigation: Made on a Mac. A simple layout, easy to navigate. Gallery: Under Portfolio there is a single gallery for Pastels. Image View: Thumbnails enlarge in a flash viewer and can’t be saved. Information on the dimension is inconsistent. 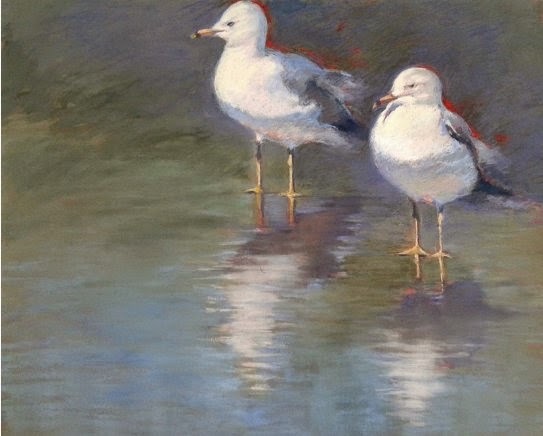 Seagulls is 23 x 31 ins. Bio: Wendy Griffin moved to Guernsey, Channel Islands, in 1973 and has lived there ever since. Inspired by the Guernsey coastline, she has been exhibiting and winning awards for her pastel landscapes in the Guernsey Eisteddfod since 2004. Navigation: An easy website, but one cannot move from one enlarged image to the next – one must return to the thumbnails. Image View: Thumbnails enlarge in a flash viewer on the same page ; there is information only on the medium ; and some have a watermark across the centre. Download is not possible. Rough Sea is 30 x 40 cms.